Yup, the 2 ways also work for deep nested objects. Well that depends. For JSON.stringify(), the order matters. So if the key-value pair are ordered differently in the two objects but are the same, it will return false. Whereas it doesn't matter in Lodash isEqual, it will return true as along as the key-value pair exists. Here's my recommendation. For a quick and dirty solution, I'd use JSON.stringify(). But for a more robust solution that cover more of those odd edge cases, use the Lodash way. This is a solution suggested by @mustafauzun0. Few things to note though, it won’t work with nested objects and the order of the keys are important. The idea behind this is similar to the stringify way. It coverts the object into a string and compare if the strings are a match. Essentially it's comparing the equality of two strings. That's why the order matters. blnkdotspace: Lodash is considerably faster. 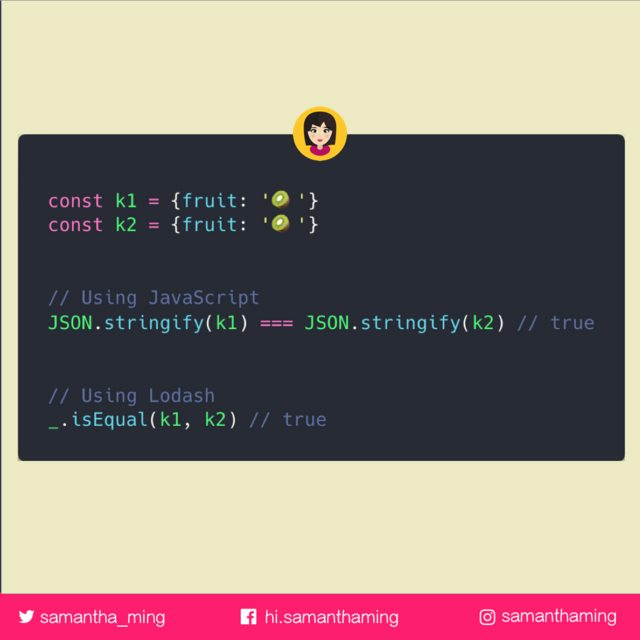 Because lodash will quit soon as it reaches the first difference, but stringify goes right till the end unnecessarily. If you have small arrays it's okay but for my personal use cases with more than 1000 events/products in a list I wouldn't ever use Stringify. Stack overflow: Is it fine to use JSON.stringify for deep comparisons and cloning?